Missed classes may be made up WITHIN the term (must arrange w/teacher). NO EXCEPTIONS. NO REFUNDS after class begins. Wear appropriate clothing, bring apron. Clay is messy! Working with clay offers an endless range of possibilities. Learn wheel throwing and handbuilding in our classes. Students create simple and complex ceramic forms, including pinch, slab, coil, sculpting/modeling. Various throwing projects, glazing and surface techniques will be explored. 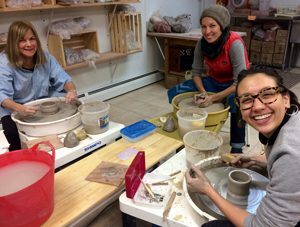 Students will learn to use studio equipment including the slab roller, extruder and wheel to make mugs, bowls, plates, teapots and more! A small group size ensures individual guidance.